It’s been a while since J and I actually ate together. We’ve been on a couple weekend trips and her mom had been in town for a while, so eating out has kind of been on the back burner. On our first Monday home together in a couple weeks, J asked me if I wanted to go out to lunch while she was feeding L. I already had a website pulled up. I was hoping she would ask that. 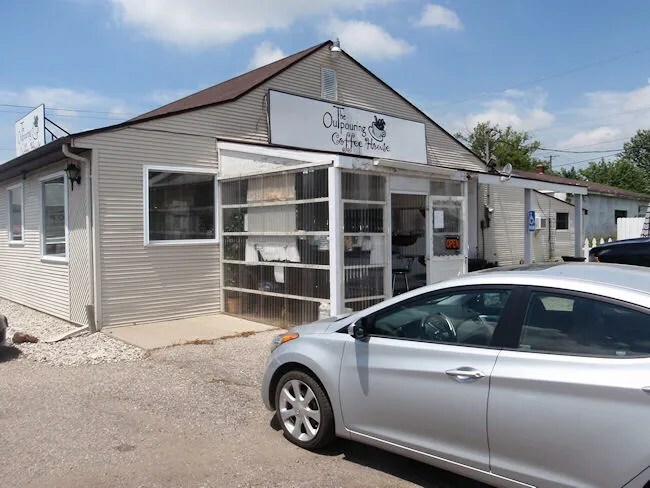 For quite a while now, I’ve been wanting to go to the Outpouring Coffee House in Paw Paw. The tiny coffee shop and cafe sits on the corner of M-43 and M-40 outside of Paw Paw. From Kalamazoo, it’s straight out on Main Street about halfway to Bangor. We were shocked when we pulled in to the parking lot a little after 1:00 and found it packed. J asked if there was a used car lot next to the restaurant. There were that many cars in the lot. After making a parking spot behind the building, we walked in to find a packed dining room. There was one table in the middle of the room that was open. J was already heading towards the lunch counter but quickly saw that I had found a table and followed me through the maze of tables. The menus were already on the table and a waitress saw us right away. First thing we did was ask for a high chair for L. As she was getting that, we decided on drinks, but still needed a couple minutes for the food. The waitress came back with a Coke and a Sprite. Neither one of us are big coffee drinkers so we didn’t even really look at the specialty drink menu which was posted on a chalk board above the lunch counter. Sandwich selections don’t include a burger, but that didn’t stop me from finding something delicious. I ordered The Stack. The artisan bread is stuffed with ham, smoked turkey, cheddar and provolone. I made sure to ask if there was mayo and the waitress said no. The sandwich is grilled and stacked high with the meats. It’s a perfect panini with enough meat to make sure you know you’re not eating just bread. The side options for the sandwich include chips which I usually go for, but it also has an option for mac ‘n cheese. Obviously, that’s what I went with. The bowl of macaroni noodles with a really creamy, cheddary sauce. The noodles were very al dente…almost not done, but it wasn’t too much of a deterrent. I still ate the whole bowl and wanted to lick it clean. J was very excited about the Grilled Cheese Panini. The cheeses are cheddar, Provolone, and Asiago and the bread is a pretzel roll. 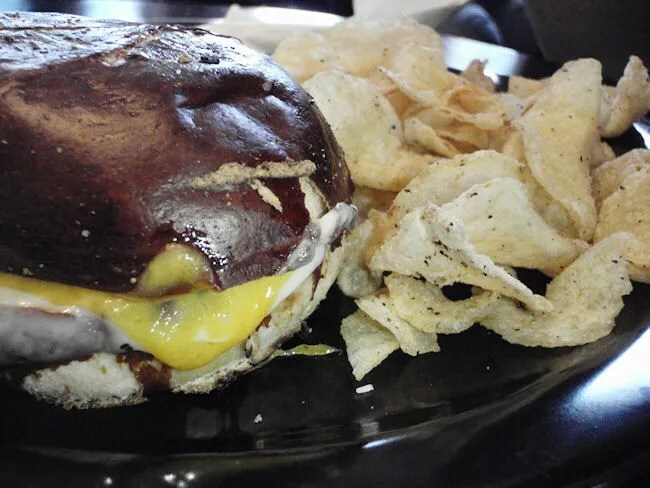 J’s love for pretzel rolls and grilled cheeses were combined in to a really delicious sandwich. She was a little surprised by how the sandwich looked, but said it was for tasty. She ordered the Salt & Pepper potato chips as her side. Luckily for me, she shared a few. Not sure if she didn’t see the mac ‘n cheese or just didn’t want that much cheese, but she seemed happy with the chips. The bill was a little over $17 and payment is done at the lunch counter. 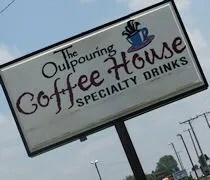 Like I said in the beginning, I’ve been wanting to go to the Outpouring Coffee House for some time. I even made the trek out there one morning for breakfast with L, but she was passed out by the time I got there and I didn’t want to wake her. This little place is a huge surprise. It just seems to be out in the middle of nowhere, even though it’s at the intersection of two major roads. 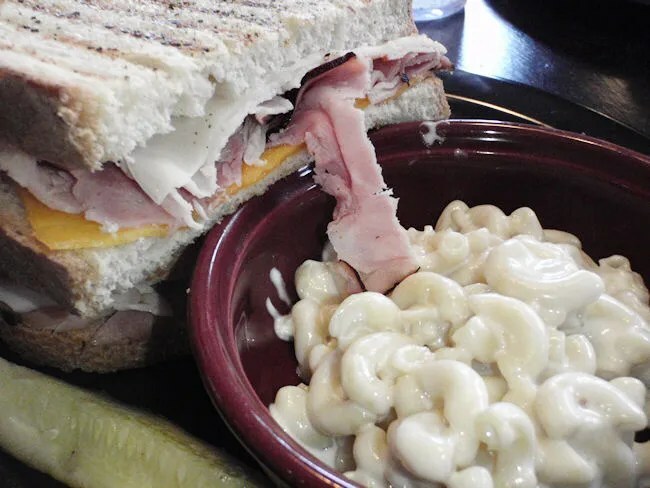 The sandwiches aren’t quite what you’d expect at a little country coffee house….and that’s a good thing.